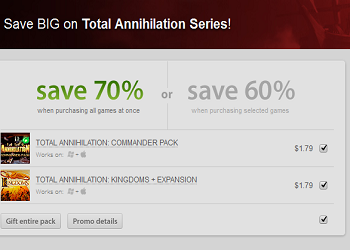 Total Annihilation and Total Annihilation: Kingdoms are 70 percent off together at GOG. While franchise's like Starcraft tend to hog the limelight of the modern RTS-scene, if you were to step back fifteen or so years the big kid on the block would have been Cavedog Entertainment's Total Annihilation. Still regarded by many fans today as the cream of the real-time strategy crop, it's a superior classic of the genre and a must-have for RTS fans. That in mind, if you don't currently have a working copy you may want to swing by GOG sometime before tomorrow. The online retailer, despite still be in throes of its Black Friday sale, is currently running a 24-hour promotion offering a whopping 70 percent discount on Total Annihilation and its fantasy follow-up Total Annihilation: Kingdoms. There are some caveats, of course. The 70 percent discount is only effective when you buy the two games together. If you buy them separately, they're only 60 percent off. The difference is maybe all of a few quarters and a dime though, so you shouldn't be too put out if you want one and not the other. That being the case, both are great games and buying them together costs less than four dollars, which you could probably find lying around your house if you looked. In other words, if you've been itching for an RTS experience to play and have yet to enjoy this classic, we'd strongly suggest you take it for a spin.